Looking for a completely UK based, broadband provider with the state-of-the-art infrastructure, offering the highest standard of broadband connectivity and 24/7 customer support for 365 days a year? Origin broadband is an ideal option for such needs and what’s more, you need not pay more for this better quality of service while you can also make extra savings with Supersaver deals from this Yorkshire based operator. Origin offers standard ADSL and fibre broadband service all across the UK. Its own core network connects more than 50 locations including Manchester and London, while other areas are connected via Openreach network, linking offices, exchange buildings and data centres across the UK. 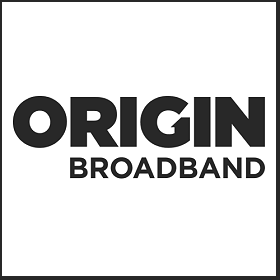 Origin offers ADSL and fibre broadband with line rental. Call plans like evening & weekend, anytime and anytime with international calls can be added with additional fee. Origin Broadband plan offers ‘up to’ 17Mbps download speed (up to 2Mbps upstream), truly unlimited data usage, free wireless router and free installation. 12 month contract applies. It is one of the cheapest, unlimited broadband deals with a monthly price of £18.49 which includes line rental. Origin Fibre package comes with ‘up to’ 38Mbps downloads speed (up to 10Mbps upstream), totally unlimited broadband usage, free installation and wifi router. It is one of the best value deals when you need superfast broadband for your home. 18 month contract applies. Opting for Supersaver 18, you can save 15% or £42.83 by paying in advance for 18 months. Origin Max offers 2x faster fibre broadband (up to 76Mbps) and truly unlimited usage. Upload speed can peak up to 19Mbps to help you upload large files in minutes. The deal comes with free activation, wireless router and free delivery. A minimum contract length of 18 months applies. What is Origin broadband good for? No extra costs like installation, router or delivery. Package includes them at no extra cost. UK based technical support anytime, all year round. One of the highlights of Origin broadband is that it is quite able to offer low cost packages to its customers using modern network and advanced technologies which accounted for its huge investments over the years. Its budget deal which is suitable for small families does not require you to pay anything for broadband but only for line rental. Its two fibre broadband deals are fairly priced and come with no setup costs. Monthly cost includes line rental to help you know the total cost that you would pay every month and all Origin broadband packages do not require you to pay anything more than that. All deals come with free installation and free delivery of routers. Origin broadband offers unlimited downloads without any fair usage policy to restrict your usage at hidden levels. Since, there is no traffic shaping or management over your connection, you can fully use your bandwidth for all your internet activities to your satisfaction. Faster speeds and unrestricted usage throughout the day and night. Origin includes a free Asus DSL-N16 wireless router with all packages and delivers it to your home free of cost. With high performance WiFi router, you can connect multiple devices via home wifi to access internet for various online activities. High end routers such as Asus RT-AC1900 WiFi router are available for upgrade with an extra fee. Like most UK providers, Origin offers two typical fibre speeds – ‘up to’ 38Mbps downstream and ‘up to’ 76Mbps downstream. Origin’s nationwide fibre service is easy to get in your area, provided you have Openreach network and landline. Upload speeds are remarkable with a range of 10Mbps – 19Mbps. Pricing is quite honest without any hidden costs and the cheaper total cost and saving opportunities can quite surprise you. Origin offers UK based customer support which is available 24 hours a day, 365 days a year via phone, email and web based applications like Twitter. You can get help whenever you need. You can save one third of your money with Supersaver options which requires you to pay in advance which results in savings of up to 31%. For instance, the entry-level Origin broadband & line rental package which usually costs £18.49 a month will cost just £154.99 a year on 12 month contract (£12.92 p/m equivalent) or just £279.99 a year on 24 month contract (£11.67 p/m equivalent) when you pay upfront. Likewise, You can save £42.83 when you pay in advance for Origin Fibre which usually costs £25.99 a month. However, Origin Fibre Supersaver 18 will cost just £424.99 upfront or £23.61 per month equivalent. Origin Max Supersaver 18 (standard price: £29.99 a month) has £39.83 discount, when you pay £499.99 upfront for the full 18 month Max service. Origin offers some of the best ‘value for money’ deals in the UK market, still, it lacks a few additional features that major ISPs offer with their packages.Price wise, you can find cheaper deals with other providers if you look out for budget packages. Origin service does not offer attractive extras like free public WiFi, web storage and internet security like BT, SKY and Virgin Media. Bundling options are limited whereas other major providers which offer TV and mobile offer lots of choice to their customers. If you need multiple services for your home, you can better consider Sky, Virgin Media and BT as bundles can help you make great savings plus you can get the right deal for all your needs.